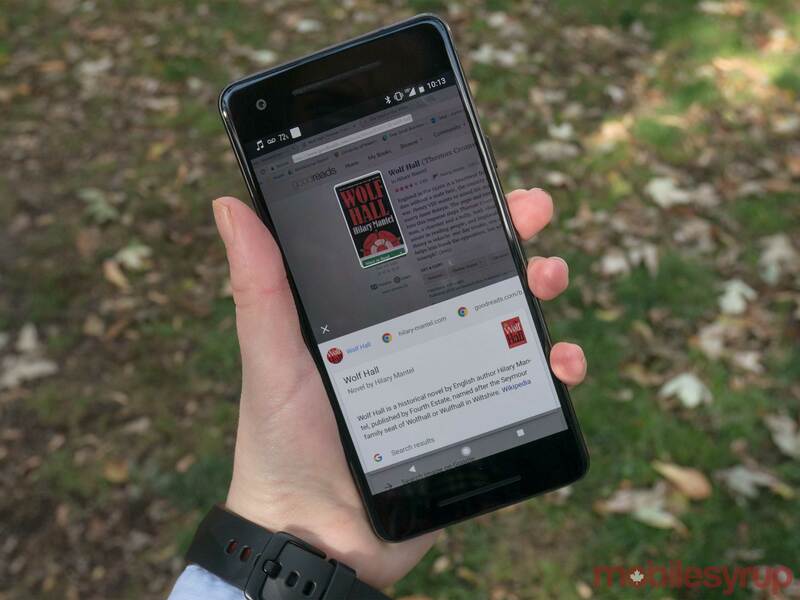 The Pixel 2 and Pixel 2 XL are the latest two smartphones to bear Google’s name, following the release of last year’s well-received Pixel and Pixel XL, as well as the scuttling of the company’s popular — and affordable — Nexus line of smartphones. While expected, the release of the Pixel 2 is an indication that Google is taking its hardware ambitions seriously, and that the release of the original Pixel was not a one-time experiment. Google’s pair of new flagship smartphones offers an updated design (though one more so than the other), additional power under the hood and a surprisingly improved camera. It’s not easy to differentiate a device at this stage in the rapidly plateauing smartphone market. Phones, for better or worse, have evolved into non-descript slabs with similar ports, features and overall utility. This has left manufacturers scrambling each year for ways to differentiate their smartphone from competitors in an effort to grab the attention of the average consumer. Over the last few years, we’ve seen trends like modularity, then dual-camera setups (which are still a point of competition), and now we have 2017’s ongoing war on bezels. 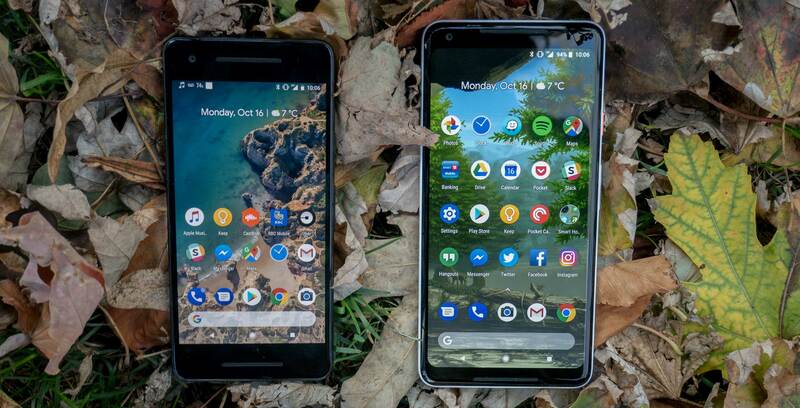 Google’s new Pixel 2 XL fights the good fight against phone borders to an extent, whereas the less modern-looking Pixel 2 ditches this arms race in favour of a design that looks decidedly last-year. The Pixel 2’s true appeal though, is that it’s an Android device that receives operating system updates first, and more importantly, that it adopts Apple’s strategy of seamlessly melding hardware and software — a mark even Samsung’s impressive devices have never quite hit. Though we’ve only spent a few days with the Pixel 2 XL and Pixel 2 at this point, Google definitely has another hit on its hands. Regardless of how you feel about Samsung’s smartphones, it’s difficult to deny the South Korean manufacturer’s design prowess. Both this year’s Note 8 and S8/S8+ are impressive looking thanks to their curved displays, top-tier cameras and industrial design. Those concerned about the Pixel 2 XL’s design will be pleased to know that the phone looks formidable when sitting beside any of Samsung’s flagship offerings. In fact, depending on your taste, the Pixel 2 XL actually even looks better than Samsung’s flagships. Make no mistake: the Pixel 2 XL is a far cry from last year’s boxy and outdated Pixel (for the record, I was actually a fan of the Pixel’s design — Patrick). The Pixel 2 XL’s display doesn’t curve at the sides like the S8 or Note 8, which helps reduce the worry of accidentally touching the phone’s display. Both the back of the Pixel 2 and Pixel 2 XL feature glass shades. Otherwise, the two devices are made from aluminum, a nice change of pace from the all-glass designs we’ve recently seen from LG, Samsung and other manufacturers. The Pixel 2 XL’s 6-inch screen isn’t quite edge-to-edge, but it still fits a much larger screen in a body that’s just slightly bigger than last year’s Pixel XL, which included a 5.5-inch display. It’s worth noting that the addition of 0.5-inches does make the 2 XL slightly more unwieldy than the first-generation Pixel XL. In comparison, the Pixel 2’s screen measures in at 5.0-inches and features a rather substantial set of bezels when compared to most other high-end smartphones released this year — apart from the iPhone 8 and iPhone 8 Plus — giving the device a somewhat dated aesthetic, more on that later. The finish of both phones’ aluminum almost feels more plastic than metallic, though the Pixel 2’s rear has a brushed aesthetic to it that gives it a decent amount of grip. A downside related to the Pixel 2 XL and Pixel 2’s aluminum exterior is the fact that neither device supports wireless charging. Notably, unlike many currently available smartphones, the Pixel 2’s design feels fun. Two of the colour options feature a power button that stands out in some way, giving the device a much-needed design flourish. 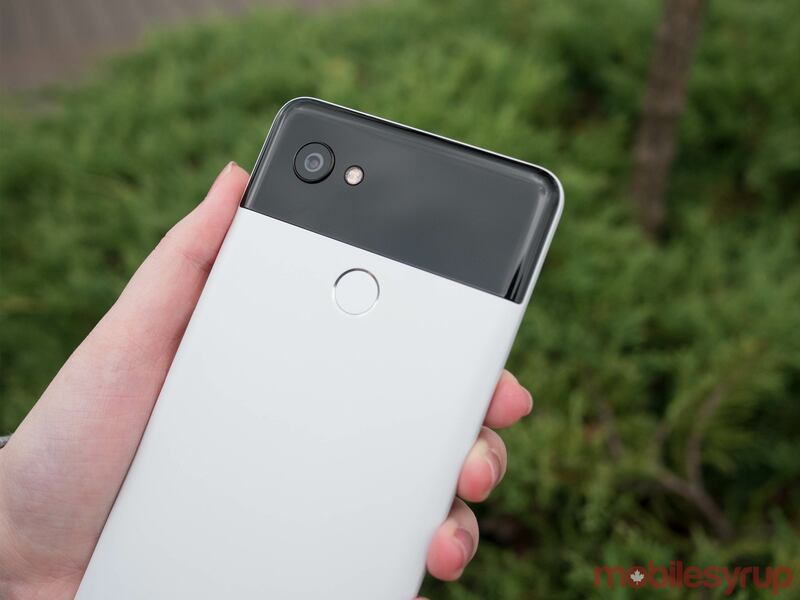 For example, the ‘panda’ black and white Pixel 2 XL features a black glass shade on the rear, coupled with a neon orange power button and a white backing. In a sea of black slab, often surfboard-shaped smartphones, the Pixel 2 XL’s panda variant feels different and exciting. 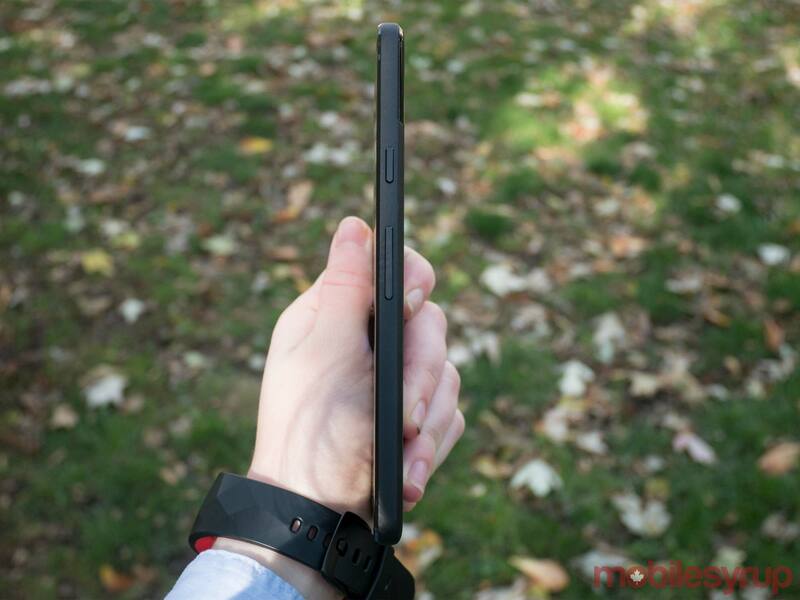 The regular all-black version of the XL 2 is less interesting, however. The Pixel 2 on the other hand, while not exactly as impressive or different as the XL 2’s panda colouring, still stands out, with the phone’s ‘Kinda Blue’ colour variant feeling reminiscent of the short-lived Nextbit Robin. 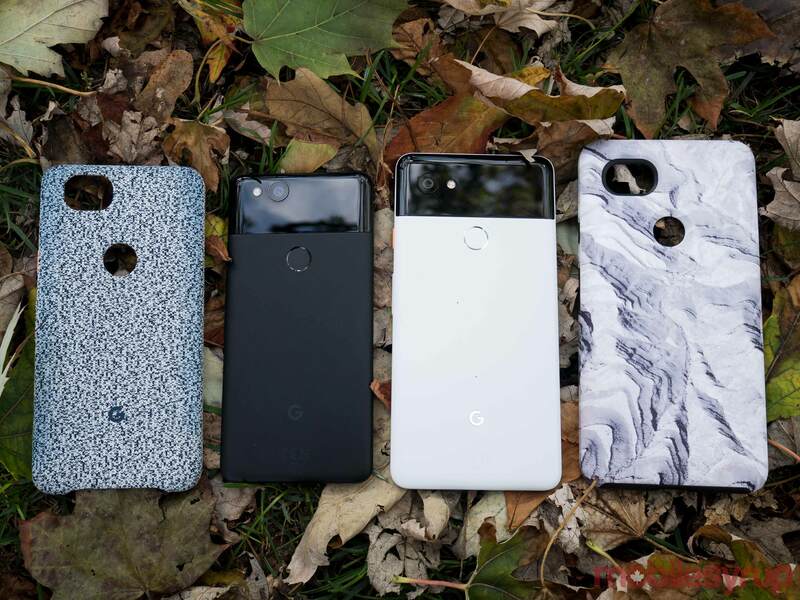 The Pixel 2 is also available in ‘Clearly White’ and ‘Just Black’ variants. 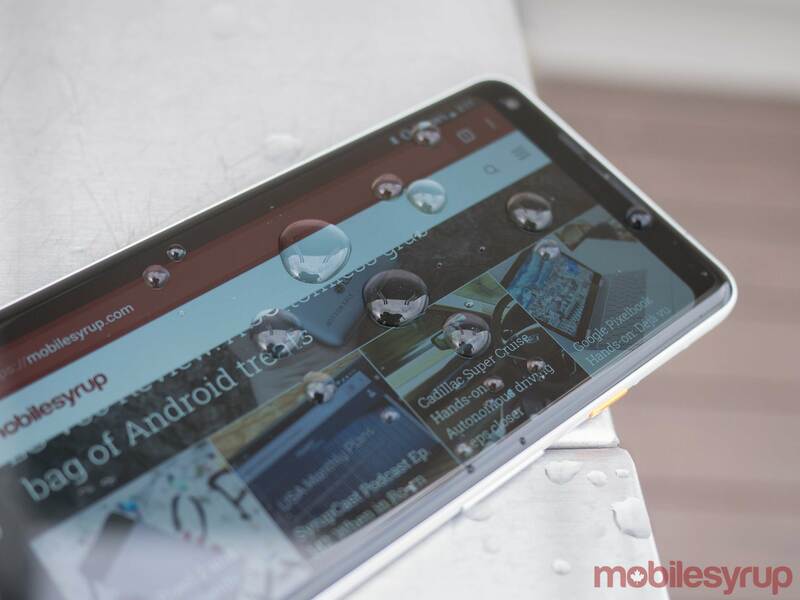 Finally, unlike the original Pixel, the Pixel 2 and the Pixel 2 XL are IP67 water and dust resistant, meaning Google’s latest flagship devices can be submerged in up to one metre of freshwater for up to 30 minutes. 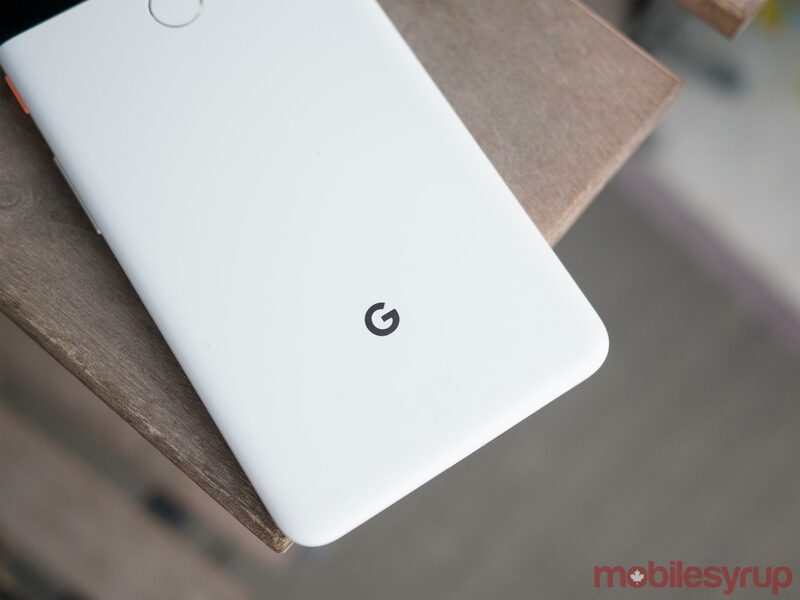 Looking solely at measurements, the Pixel 2 comes in at 145.7mm x 69.7mm 7.8mm with a weight of 143g, while the Pixel 2 XL measures in at 157.9mm x 76.7mm x 7.9mm and 175g. Much of the chatter surrounding the Pixel 2 and Pixel 2 XL has focused on the phone’s differing bezels. Let’s be clear though: neither device feature bezels that match recently released (or upcoming) smartphones that have nearly non-existent bezels, including the Essential Phone and the upcoming iPhone X. That said, this means that neither the Pixel 2 nor the Pixel 2 XL includes the controversial notch many people hold as a point of contention with the aforementioned two smartphones. The Pixel 2 XL’s display also curves at its corners, similar to the LG G6 and LG V30 — which makes sense, given LG is manufacturing the Pixel 2 XL. Similar to the G6 and V30, some apps have been optimized for this screen shape, while others have not. The Pixel 2 XL is the flashier of the two phones in terms of display, featuring a 6-inch plastic OLED display with a contrast ratio of 100,000:1 and a 2880 x 1440 pixel resolution with an 18:9 aspect ratio. Of note, for some reason Google hasn’t yet opted to support Dolby Vision or HDR 10, the two competing high-dynamic range standards, with either the Pixel 2 or Pixel 2 XL (though it does support standard HDR). It’s possible this feature could be added in the future via a software update. The 2 XL’s display, however, looks great and is a substantial step above last year’s 1440 x 2560 pixel AMOLED screen. Whether you’re watching high-resolution YouTube videos, playing games or just generally browsing the internet, the Pixel 2 XL’s screen looks solid, though a yellow undertone prevents it from matching Samsung’s marquee display technology. The HTC-made Pixel 2 features sharp-edged chunky bezels surrounding its 5-inch display that look clumsy in comparison to the 2 XL’s slim rounded bezels, and aren’t much of an upgrade from last year’s device. In fact, the Pixel 2 actually has a lower screen-to-body ratio than the original Pixel — 67.9 percent to 69 percent, respectively. Not only is the screen smaller and surrounded by chunkier bezels, it’s also a clear step down from the larger Pixel in terms of brightness and a tendency towards over-saturation. The Pixel 2 features a 1080 x 1920 pixel 16:9 AMOLED display. Though it’s notably brighter than the original Pixel’s display, the Pixel 2’s screen is dim in comparison to the iPhone 8 Plus and Samsung Galaxy Note 8, which sometimes results in poor readability in direct sunlight. It also has a slightly overbearing warmth that results in the display appearing yellow-toned when compared with the Pixel 2 XL, iPhone 8 Plus/iPhone 8 and Samsung Galaxy Note 8. Both phones include a ‘Vivid Colors’ toggle that allows users to turn off the vivid and perhaps overly warm tones that are pre-set for the device. It’s worth noting that this doesn’t fully address the phone’s tendency towards yellow undertones. 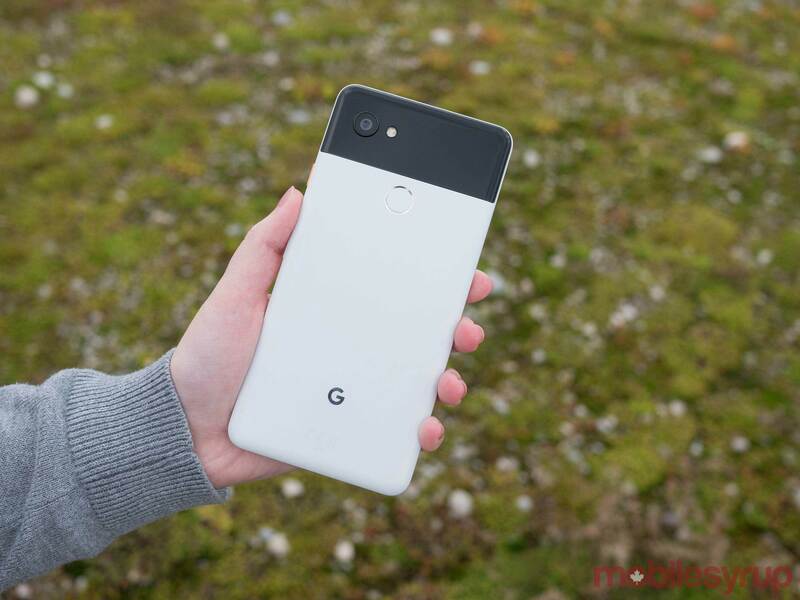 The Pixel 2 and 2 XL’s cameras feature a 12.2-megapixel sensor with f/1.8 aperture lens on the rear, and an 8-megapixel sensor with a f/2.4 aperture lens on the front. The rear shooter features optical and electronic image stabilization — an improvement in stability over last year — as well as laser and dual-pixel phase detection, making for a quick focus. Portrait Mode puts focus on the subject of a picture by adding a soft blur to the background. On the left: Google’s Portrait Mode fails to blur the right-hand corner. On the right: Apple’s bokeh effect blurs the entire background. This is a common issue with the Pixel 2 and Pixel 2 XL’s portrait mode. To do this, the camera uses its split pixels like two cameras, capturing two images — one slightly offset from the other. It also takes multiple images, then gathers the information together to create a depth map and uses that info to intelligently blur everything around the subject. The only problem? The camera is fairly easy to trick. In the example below, in one Portrait Mode shot of a porcelain cat, the AI feature got confused by a metal bar splitting the screen, blurring one half, but not the other. In our tests on people, we also often ended up with messy or inaccurate edges. In comparison to a much smoother experience on the latest iPhones, Google’s feature just felt under-baked. Aside from Portrait Mode — which isn’t likely to make or break a user’s camera experience — the Pixel 2 is an improvement over last year’s already excellent performance. To begin with, it’s remarkably quick to launch and focus — notably better in this respect than the cameras included in the latest premium handsets from LG, Sony and Motorola. The camera performed well in high dynamic range situations (meaning scenes with extreme dark and light). In a picture I shot that featured the sun peeking out from behind grey storm clouds, there was some solar flare, and the direct area of the sun was predictably blown out, but the rest of the scene remained well-lit and the colours came through strongly. The camera also offers crisp detail without over-sharpening, an issue with the LG V30. Zoom into a picture of trees, for instance, and the leaves will become less defined, but you won’t see a strangely artificial-looking noisy texture or any added artifacts. Low-light and nighttime snaps were also impressive. The camera not only delivered a stunning level of clarity, it also retained the scene’s colours. While the Pixel 2 shoots exceptionally well in auto, those who like to mess around with advanced settings will be disappointed. The Pixel 2’s camera app is simple. You can select photo and video resolution and you can set a manual control for toggling on and off HDR+ mode (otherwise it’s automatically on) -– but that’s about it. Those who’d like more control, or want to capture RAW files, will have to download an alternate camera app. Video-capture clearly benefited from the addition of optical image stabilization. Capture is exceedingly smooth, even when panning, and the footage looks crisp and well-saturated. As for the selfie cam, the ‘Portrait Mode’ effect is available, even though it doesn’t have the same dual-pixel capabilities — leading to some less-than-optimal results. It’s not overly remarkable, but did offer good detail and strong colour saturation. The entire experience of using Google’s own special edition flavour of Android 8.0 Oreo is simple and easy. 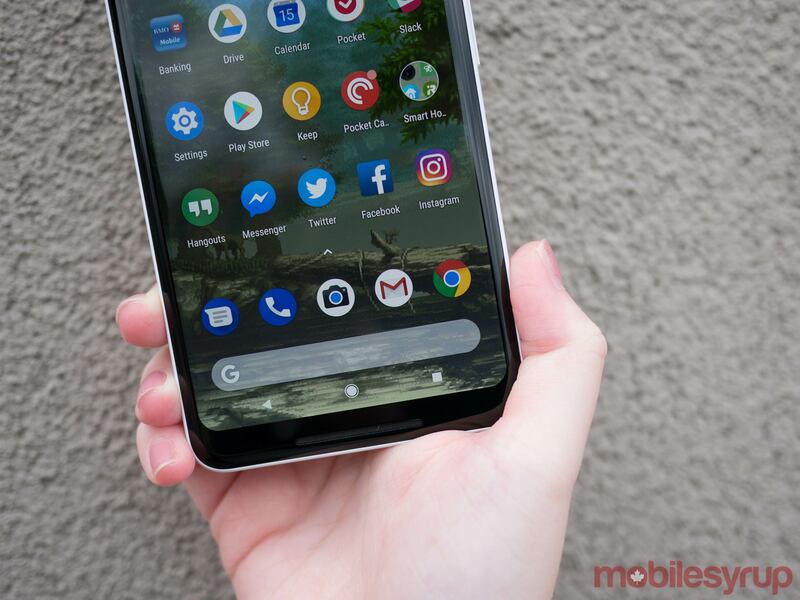 On the home screen, there’s a subtle date and weather bar, space for apps and a toolbar of frequently-used apps on top of a search bar, which can be used to search within the phone or the web. Since Google knows a thing or two about searching, this feature works well and cuts out the multi-step process of opening a browser every time you want to look something up. Pull up on the search bar and users will find the app drawer. Set permanently underneath are virtual buttons for home, back and apps list. Pull down from the top and users get the standard notifications and settings shade. The above functions and layout comprise the core of a user’s everyday interactions. It is contained and simple, without much room for error — something you often hear when people refer to the benefits of an iPhone. 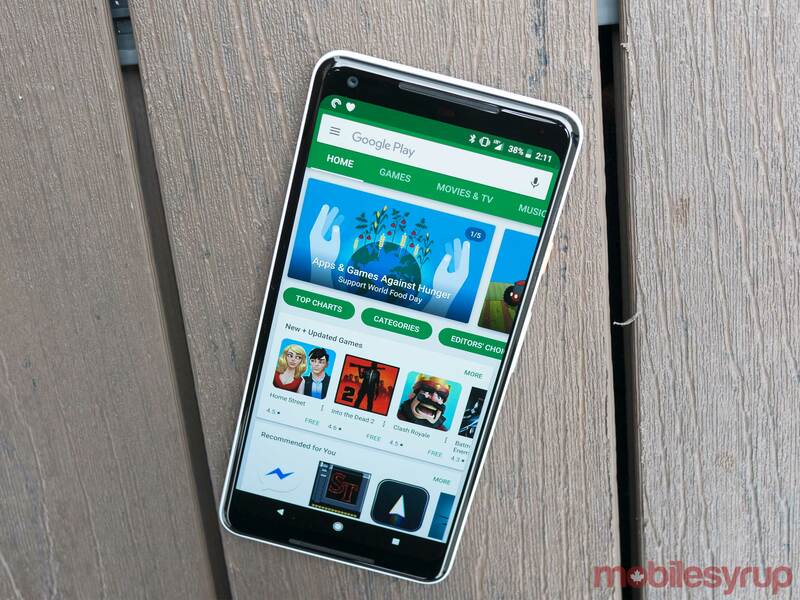 On top of those basic functions, users can also swipe to the right for Google Now and — new this year — users can squeeze the phone’s frame to bring up Google Assistant with a satisfying haptic vibration. It would have been nice to be able customize this feature with different actions, however. 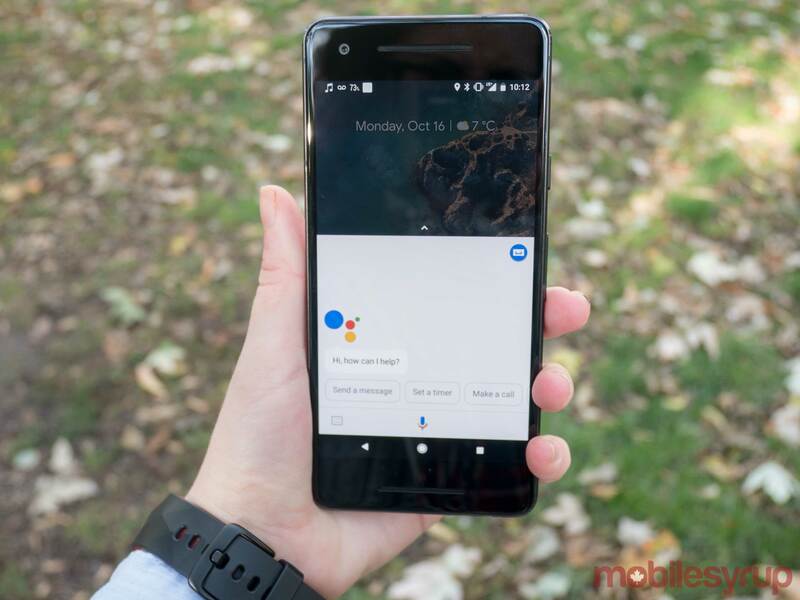 As for the Google Assistant itself, it remains perhaps the most intelligent and skilled personal assistant AI on a mobile device. The usefulness of this technology rests largely on how much information can be culled from the user, and with the ubiquity of Google accounts, the company certainly has a leg-up in this regard. While it’s not yet one of the main selling points of the Pixel, it surely will be in the future. Google’s AI also appears in Lens, a feature that is now fully integrated into the smartphone through the Photos app and will be implemented into the Google Assistant in the future. Lens analyzes photos and delivers related links. For instance, take a picture of a poster, and Lens might read the text and provide links to a related website. While Lens doesn’t always pick up everything from a picture, it works often enough that it became second habit for me to snap a picture of something rather than jot it down, using Lens to browse related content later. There’s also the always-listening, Shazam-type feature, which works even when the phone is asleep by listening to the music and displaying the song title and artist on the always-on display. The feature works well, especially considering it doesn’t tap into the cloud to find the songs, instead using data local saved to the device. For that reason, however, more under-the-radar artists aren’t likely to be recognized. Still, it’s generally a useful feature, and doesn’t require any work on the user’s part. Ultimately, that’s what is great about the Pixel 2’s UI: it doesn’t require extra work from the user. It’s simple, intuitive and extremely intelligent. Google stocks Qualcomm’s octa-core Snapdragon 835 chipset in both of its second-generation Pixel handsets, along with 4GB of RAM and 64GB or 128GB of internal storage, depending on the model. Four of the platform’s eight cores are clocked at 2.35GHz, while the other four are clocked at 1.9GHz. In practice, the 835 and its Adreno 540 graphics processor pair with Google’s software to create an incredibly fluid and quick experience. During everyday tasks, the Pixel 2 was always responsive and quick, with no lag or glitchy scrolling. I did experience one app crash and one random reboot, but neither became a common occurrence. Primarily, it was smooth sailing, even when multi-tasking between several different heavy processing apps. As for games and entertainment, I was incredibly impressed by the device’s smooth -– nearly flawless -– graphics rendering. Additionally, the phone handled heat well, rarely exceeding 30 degrees Celsius. The hottest it got was during charging, when it peaked to 41 degrees Celsius. Beyond display, battery size is the second major stark difference between the Pixel 2 and the Pixel 2 XL. 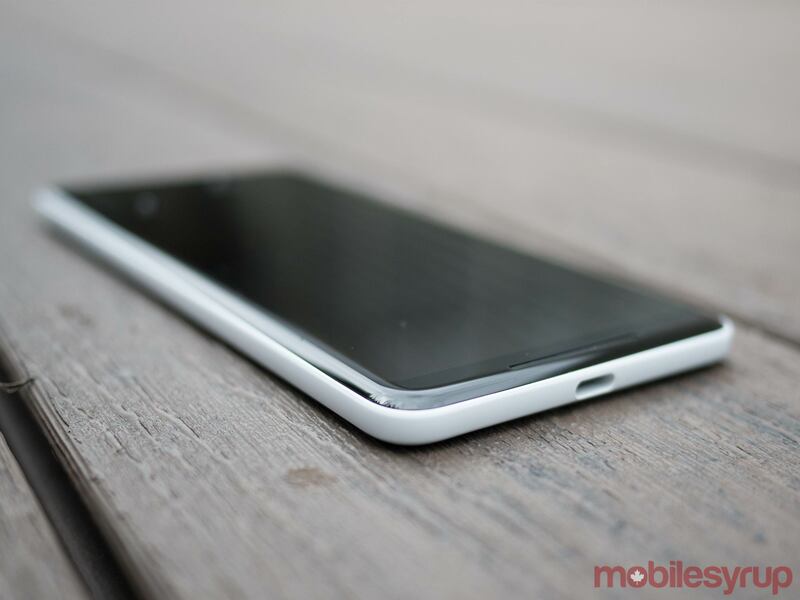 The 2 XL’s battery measures in at an impressive 3,520mAh. 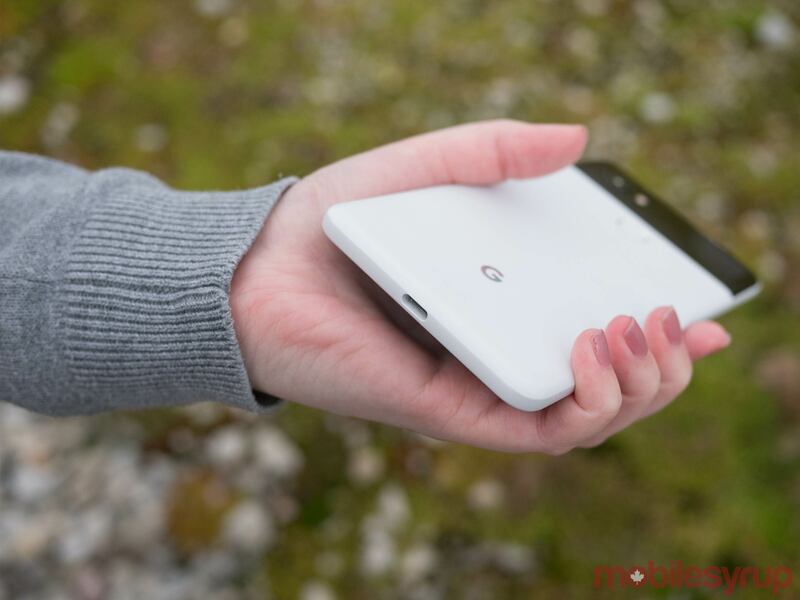 In the short period of time MobileSyrup spent with the Pixel 2 XL, the device’s battery life has been exemplary, lasting well beyond 24 hours with moderate to heavy use and the display’s brightness set to about 75 percent. The Pixel 2 features a non-removable Li-Ion 2,700mAh battery — quite a difference from the Pixel 2 XL’s hefty power source. The battery life was average but reliable. Charging from zero percent using Google’s outlet charger took about two hours. On one charge, the Pixel 2 was generally able to provide about 22 hours of use before dying. For reference, usage during that period included multiple hours of Wi-Fi and data music streaming, one or two hours of web browsing and about 30 minutes of calling. Overheating was not an issue for the Pixel 2, which rarely crested 30 degrees Celsius, a positive sign for lasting battery health. 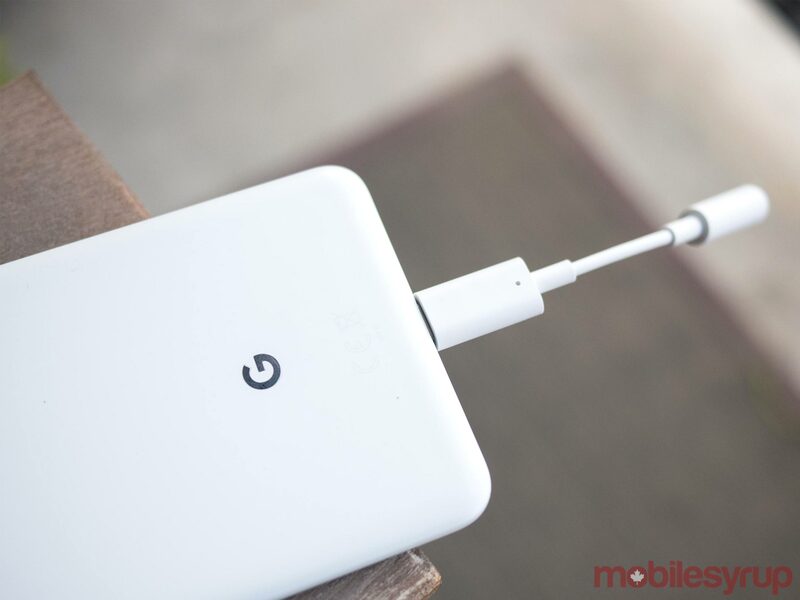 One of the most controversial moves Google made with its Pixel 2 was to exclude the headphone jack, even after going out of its way at last year’s Pixel reveal by shading Apple for its choice to leave the 3.5mm headphone jack port behind. However, at this point, the move seems inevitable. Apple, Motorola and Huawei have all made the move. Sure, some phones like the LG V30 are clinging to impressive digital-to-analogue converters — a component that turns digital music in an electric signal for playback through headphones or speakers — but the tactic of using audio as a main selling point hasn’t exactly worked for the company in the past. 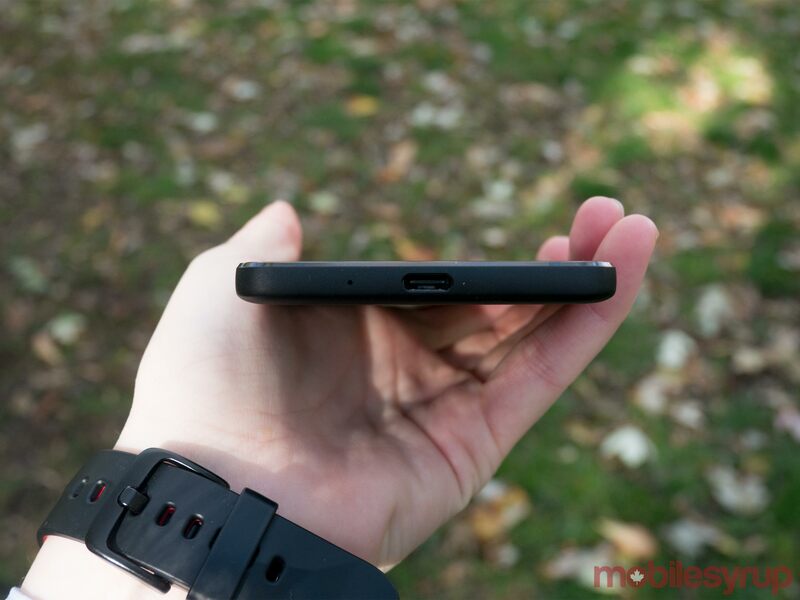 Plus, Google throws a 3.5mm support dongle in the box. The dongle includes its own DAC, and now costs only $10 to replace. Altogether, it’s not a huge inconvenience, though of course for simplicity’s sake it would be easier if the company had just held on to the port a little while longer, until wireless headphones become more commonplace. Through the Beats EP wired headphones and the Pixel 2’s in-box dongle, which includes a digital-to-analogue converter, audio was full-bodied and relatively well-articulated. It was pleasant and smooth enough to listen to for hours on end without irritation. The device’s audio doesn’t reach the same heights that the LG V30, with its 32-bit HiFi Quad DAC, can achieve, but it still provides a high-end experience. 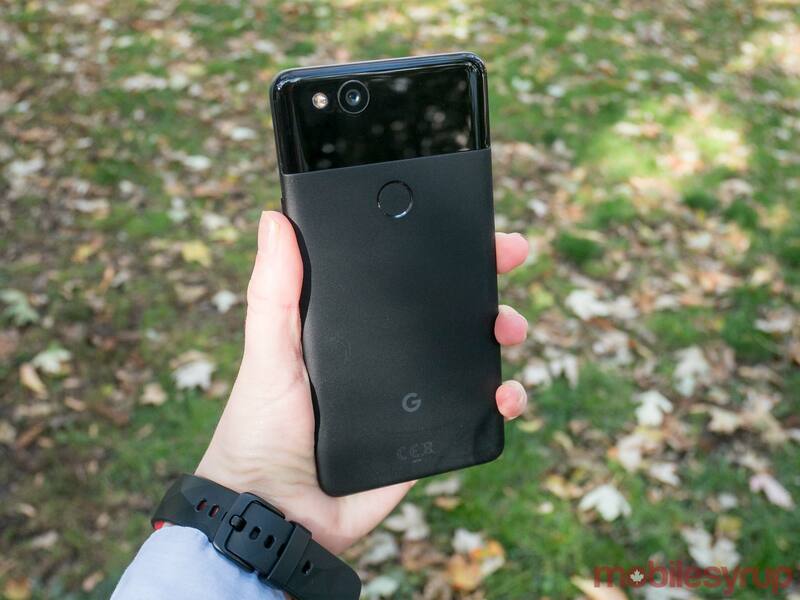 Update 11/15/17: Given the various issues that have popped up surrounding the Pixel 2 XL since the phone’s release, we’ve lowered the review’s overall score to eight out of 10. For more on how we came to this decision, check out this story. Update 10/24/17: Various outlets with early Pixel 2 XL review units are reporting the device’s display suffers from screen burn-in issues. While our review Pixel 2 XL initially didn’t suffer from problems, screen burn-in eventually appeared. We’re unsure how widespread this issue is and if it gets worse with time. Below is an image of the problem. It's difficult to find a significant fault with the Pixel 2 XL and the same can be said about the Pixel 2, save for its lacklustre display (which really isn't that bad) and substantial bezels. 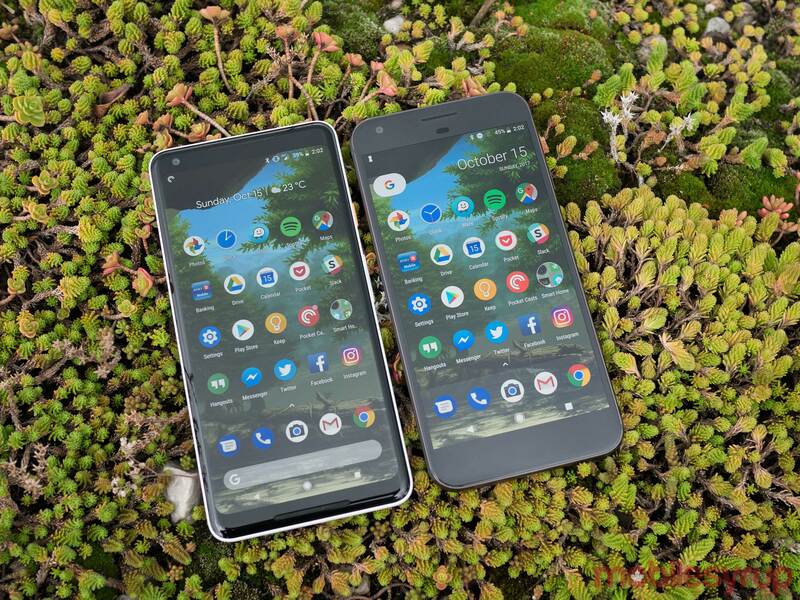 Google's Pixel brand has come into its own with the release of the Pixel 2 and Pixel 2 XL, with the tech giant releasing a smartphone that's completely capable of going toe-to-toe with any of Samsung's flagship offerings, but more importantly for the Mountain View, California company, Apple. 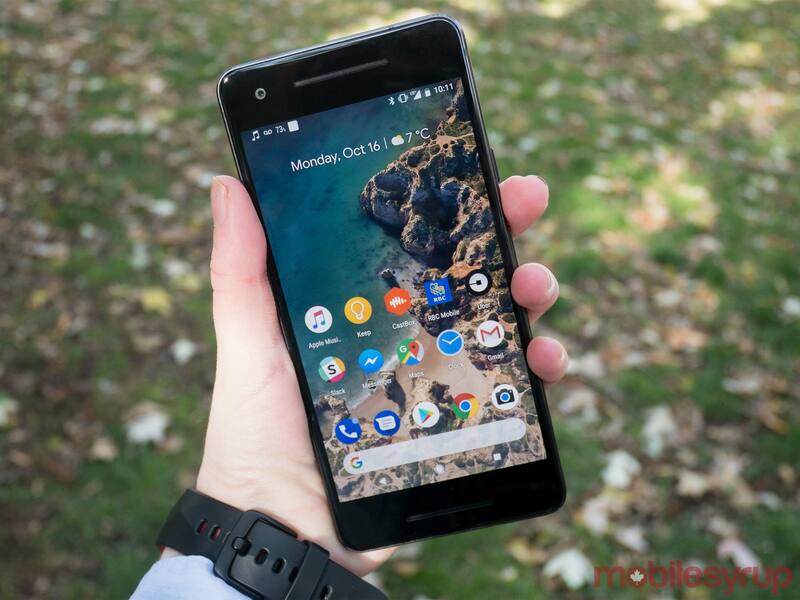 The main question surrounding Google's Pixel 2 and Pixel 2 XL, however, is whether or not the tech giant will be able to manufacture enough of the phones to keep them in stock, an issue that plagued the original Pixel right up to the reveal of its successor. It's also unlikely Google's latest Pixel offering will take a significant chunk out of the iPhone and Samsung's Galaxy devices in terms of sales, at least not yet. 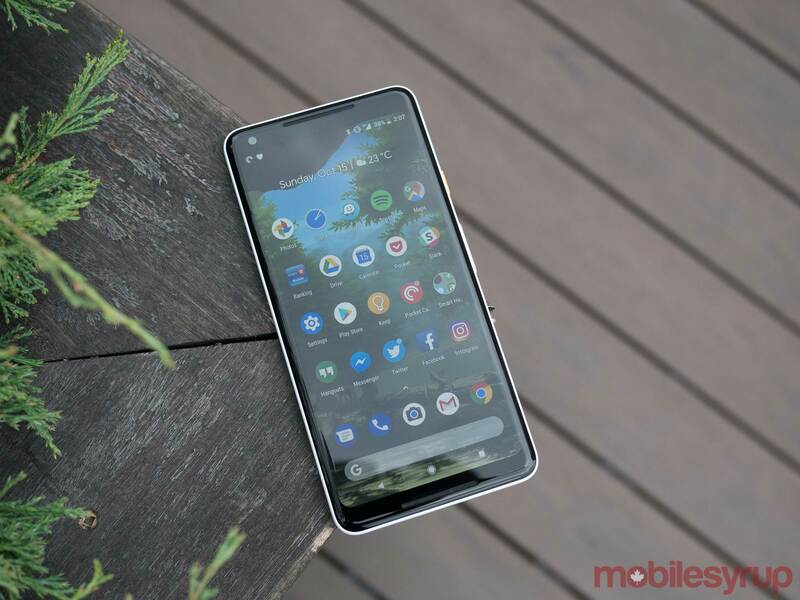 What the release of the Pixel 2 and the Pixel 2 XL does mark, however, is a renewed commitment by Google in terms of its hardware ambitions, with both devices offering a new benchmark in terms of Android quality and functionality. 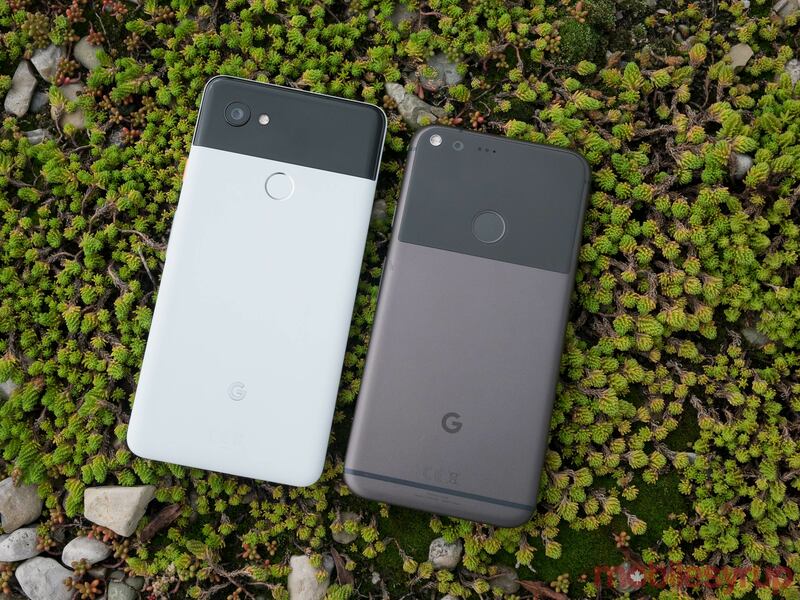 The 64GB and 128GB Pixel 2 models is priced at $899 CAD and $1,029 respectively. As for the Pixel 2 XL, the 64GB and 128GB models cost $1,159 and $1,289 each. "It's difficult to find a significant fault with the Pixel 2 XL and the same can be said about the Pixel 2"